A year for “Why not”? 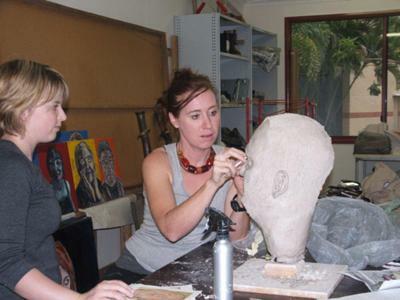 Tropical North Queensland Institute of TAFE Certificate IV in Contemporary Art and Craft or the Diploma of Visual Arts provides the skills and knowledge needed to gain a sustainable creative career. While art has been a lifelong passion, it has only been through the last 12 months, as I have completed my Diploma of Visual Arts at Tropical North Queensland Institute of TAFE, that I have seen the potential to make it a career and a life’s choice. I embarked upon an arts practice as a mature-aged practitioner. This does not lessen my desire or my hunger for achievement, but quite pointedly enhances it. Time has taught me patience, life has taught me to question and my TAFE studies have provided me with a belief in myself and in my artwork. There are innumerable artists that are trying to establish themselves with a view to producing an income from their work. However, I have learnt that in order to be successful in this goal, it is essential to have more than just great artwork. An overarching strategy is crucial. While the creation of my art is important, without a plan, it will always remain an expensive but satisfying hobby. Thankfully, my studies within the Diploma of Visual Arts at TAFE have provided the knowledge and skills required for creating a viable arts practice. For an emerging artist, an experienced guide is invaluable. A mentor can offer advice, inspire, challenge and give much needed feedback, in what is essentially an isolating occupation. Knowledge of what is important and what is involved in planning for a sustainable career in the arts industry is a crucial part to an arts practice. The TAFE institute has an incredible wealth of experienced practising artists that become mentors, guides, facilitators and friends. Darren Barden, Barbara Dover, Kerry Grierson, Carole Lomax, Julie Poulsen and Jennifer Valmadre have all, in some way, contributed to my current and potential success. Evolving from the TAFE experience, Knock Knock Contemporary Artists’ Initiative is a local Artist Run Initiative (ARI) connecting like-minded artists: Raewyn Biggs, Louisa Ennis-Thomas, Adrienne Shaw, Vide Smith and myself. Since its inception in December 2010, Knock Knock has held three group exhibitions, secured two grants, sent delegates to an ARI symposium in Sydney, participated in workshops, held artists’ forums and been actively involved in the Cairns art scene. This year will see a continued dynamic exhibition and event programme, beginning in March with our annual exhibition, Women in the Arts. This year’s show will respond to the theme, The Bag: Object or Obsession? 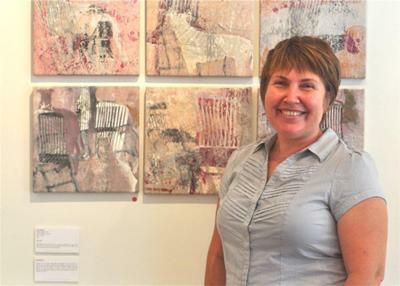 TAFE has allowed me to see the possibilities and gain the confidence I need to become an exhibiting artist. My first solo exhibition is to be held in June this year at c1907 Contemporary Artspace. Looking to the future, as a member of Knock Knock, I am committed to participating in community arts projects and our ongoing exhibition programme, both locally and further afield. In addition to my collaborative work, I aim to establish myself as a successful solo exhibiting artist with a sustainable arts practice. As I took my first steps through the entry to the Visual Arts facilities at TAFE, commonly known to arts students as ‘Y’ Block, I thought ‘Why not? !’ Perhaps 2012 is someone else’s year for “Why not?”. Are you interested in participating in a painting, sculpture, drawing or ceramics class? Or perhaps you have always wanted to do a full time course in the Visual Arts? Opportunities are now being offered in both Certificate 4 and Diploma of Visual Art at TAFE. Do you have time restrictions due to work or family? You might be interested to know we welcome both full time and part time students – part timers can attend as little as one day a week for the full year. This is an excellent environment in which to pursue the creative interest of your choice with a team of highly experienced teachers excelling at their individual areas of competency. 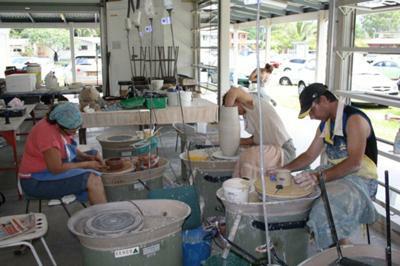 Kerry Grierson has over 25 years of hands-on experience in the teaching and production of ceramics. Kerry brings a fresh and generous approach to the craft of ceramics, combining a mastery of techniques with a high level of creative interpretation. Jenny Valmadre, Barbara Dover and Julie Poulsen are all established professional artists with a studio practice. As part time teachers they bring their personally enriched skills, techniques and insightful knowledge to their teaching practice. 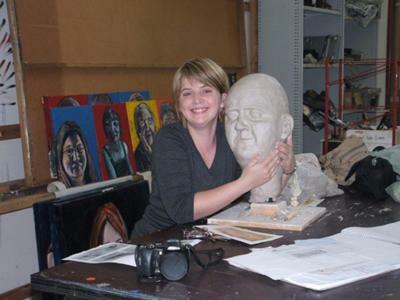 Carole Lomax has extended her teaching pathway from ceramics to Drawing teacher. A skilled draftsperson, she encourages a solid grounding in traditional skills before exploring contemporary drawing techniques.